Out at the Shoppes of Kildaire, you’ve got some pretty good eating for lunch. 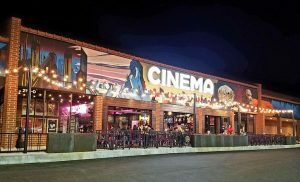 After shopping at Trader Joe’s, you could pop into Yuri for Japanese, Patrick Jane’s for pizza,Tijuana Flats for Mexican-American and now City Barbeque for smoked meats and down-home sides. 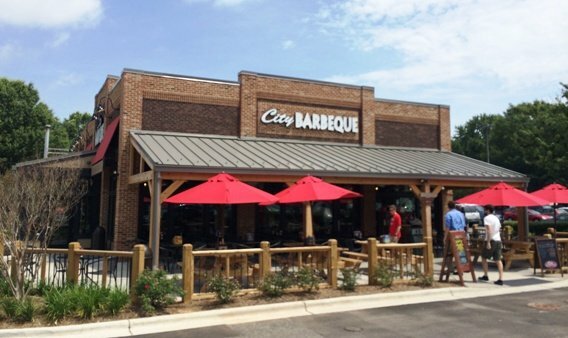 Part of a smallish (23 locations) barbeque chain based out of Ohio, City Barbeque opened up its first NC location on April 12. I was invited to the Media day but wasn’t able to make it. Thankfully I was able to jump in for lunch later that week and see what’s up here at City Barbeque. And after my first visit I can say it was mostly good, if not perfect. First thing you’ll notice about City Barbeque is its squat, ranch like location complete with wood picnic tables out front. Typically a good sign in my eyes, inside it continues on with the country and western motif with rough hewn wood panels and a rustic feel. There’s a long line snaking out the side of City Barbeque which is a good sign for them. Outside of Danny’s, I don’t know of much que in the area so there’s not much competition. Inside the line moves past ice-filled freezers with Nehi sodas cooling inside and two cashiers up front take our order. 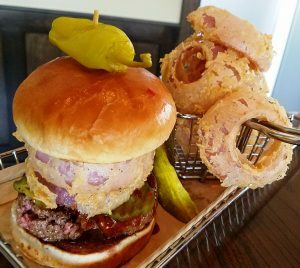 We go with the deluxe City Sampler ($24 for 2) with a bit of everything since it’s our first visit! It’s time to go find a table and hunker down for mah meat! 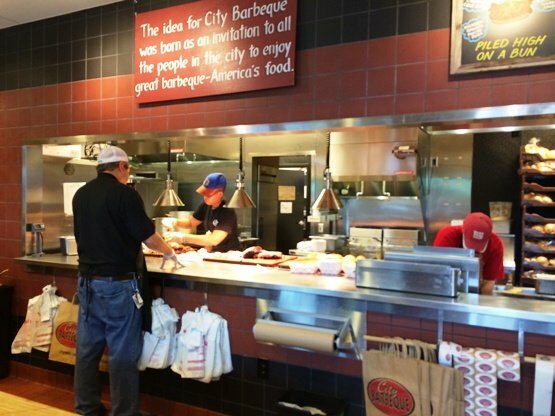 Looking around City Barbeque, the feel is relatively comfortable but a bit corporate. Inside a cardboard six-pack holder you’ll find your four sauces along with a roll of brown paper towels to try and keep clean. Even though it’s busy, we’re able to get a table easily and it only takes 10 to 15 minutes for our food to come on out. 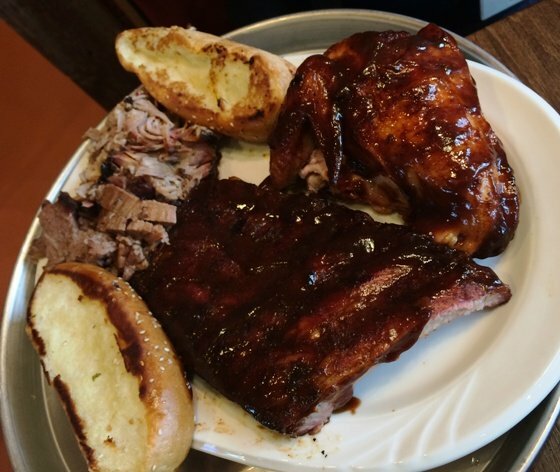 And it looks like a lotta food… We get two aluminum trays with sides on one side, large platter of meat on the other. We’ve got barbeque ribs, chicken, pulled pork, brisket along with corn bread, Texas toast, sweet vinegar slaw and potato salad. We break into the ribs first which seem to be St. Louis style (sweetish, brown sugar sauce) and they have decent smoke inside, tender and tasty. The brisket is thick-ish pieces which are decent but not quite moist enough. I like mine with a bit of fat cap on top since the meat tends to be lean but it’s missing here. The pulled pork is ok and we don’t quite make it to the chicken but my co-worker said it may have been the best part of the meats! The sides at City Barbeque fared better in my eyes. 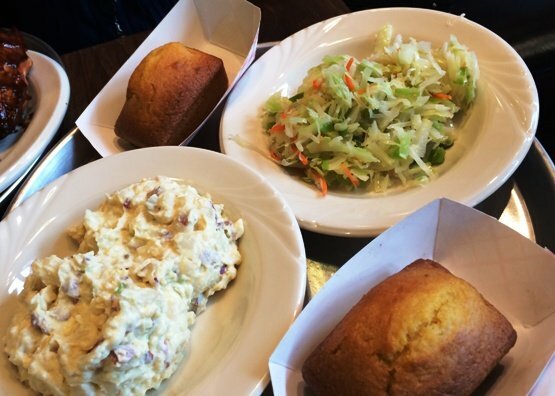 The slaw was fresh and a nice distraction to the meat while the potato salad was pretty creamy and delicious. Corn bread was solid and I didn’t make it to the T-toast. All in all I was happy with my visit to City Barbeque and it’s a solid choice for a meal. They’re off to a great start and the only aspect that I’m not super fond of is the chain-factor. 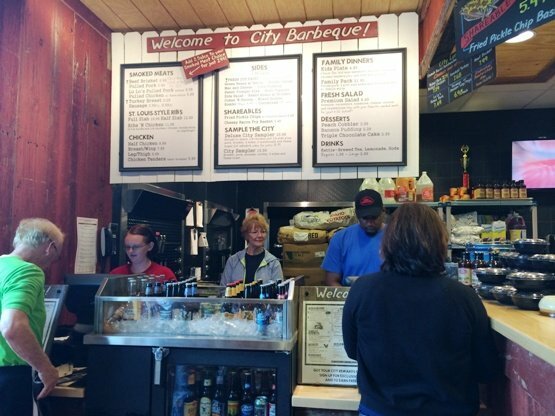 There’s something just noticeable about any corporate chain that makes for a slightly different, less personal feel and there’s a bit of that happening here at City Barbeque. I’ll give ’em a B for their food which was helped out by the sides but that’s plenty good enough for most people in the area. I’m really looking forward to my visit to Texas next month so I can see how it’s done there and that may have me re-thinking my meal here at City Barbeque! But good start so far, I always enjoy mah smoked meats! I’m a fan of pretty much all BBQ but I have to say that City BBQ was lackluster for me. The pulled pork and hushpuppies were bland, and I didn’t care for the sauces too much. I like Danny’s better, but that’s not saying a whole lot. The side of corn pudding I had was good. 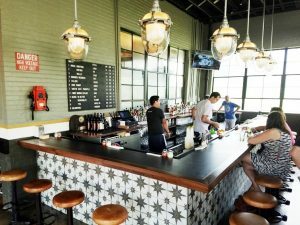 It’s true, it would be awesome to have a real down-home joint around Cary somewhere. This doesn’t fit the bill either, but I did hear that Red Hot & Blue is making a return to Waverly Place. Have fun in Texas – I’m sure you’ll get some good smoked meats there! Yep, heard the same thing about RHB Ben and I won’t disagree with you on City BBQ. Thought they were ok but also figure that they may get better over time. Excited to do que down here in TX, more to come!